Backing both Bayern Munchen and Chelsea to score is the best way to attack what is the most interesting UEFA Super Cup edition since the competition reverted to a one-off game. There are so many headline angles for the match between last season’s UEFA Champions League winner, Bayern Munchen, and last season’s UEFA Europa League winner, Chelsea. The two teams met in the 2012 UEFA Champions League final in which Bayern bossed the game from start to finish and ended up losing on penalties in front of its own supporters. 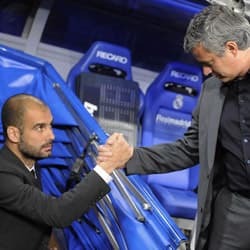 And there is the rivalry between Bayern boss Josep Guardiola and Chelsea manager Jose Mourinho, which developed during the latter’s time coaching first Internazionale and then Real Madrid in big matches versus the former’s Barcelona. The UEFA Super Cup has a reputation as being a glorified friendly, albeit one associated with a trophy, that serves to entertain officials attending the draws for the group stages of UEFA’s top club competitions and little else. But the presence of Bayern Munchen and Chelsea, Guardiola and Mourinho, means that it will be a serious game in Prague. A sign of that was the decision of Guardiola to rest half of Bayern’s first-choice side for its German Bundesliga away match against Freiburg on Tuesday, a game that ended 1-1. As the UEFA Champions League title holder, Bayern Munchen has every right to be the UEFA Super Cup favourite, with William Hill offering odds of 1.83 about FC Hollywood getting the job done in 90 minutes. Furthermore, Guardiola holds a significant lead in his head-to-head battle versus Mourinho, with the Spaniard registering seven wins to the Portuguese’s two and six draws. Guardiola’s Barcelona won two and drew one of its four games against Mourinho’s Internazionale, while Guardiola’s Barcelona won five and drew five of its 11 matches versus Mourinho’s Real Madrid. Mourinho may be known as the Special One but he has struggled to beat Guardiola’s teams since they first locked horns in September 2009. However, instead of backing Bayern Munchen at 1.83 to win the UEFA Super Cup and gain some degree of revenge for its UEFA Champions League final loss to Chelsea 15 months ago, getting on both sides to score at a similar price – 1.73 with Bet365 and BetVictor – appeals as a better value play. Since losing to Chelsea in a UEFA Champions League final that no-one will forget in a hurry, Bayern Munchen has played 63 games in all competitions. Bayern Munchen has scored in 62 of those matches, with the exception being its UEFA Champions League home game against Arsenal in March 2013. Having won the first leg of the tie 3-1 in London, Bayern Munchen took it easy in the second leg and costed to an aggregate victory. To all intents and purposes, it was a dead rubber because Arsenal needed a miracle to qualify and Bayern Munchen had one eye on its German Bundesliga away match versus Leverkusen that was on three days later. Chelsea had scored in each of its last 21 games across all tournaments before Mourinho’s cautious approach contributed to its English Premier League 0-0 draw against Manchester United at Old Trafford earlier this week. One can expect a change of tactics for the UEFA Super Cup, particularly as Mourinho will have noticed that Bayern Munchen has looked somewhat vulnerable at the back under Guardiola. That is because Guardiola has made a subtle change to the system that Bayern Munchen used to such devastating effect last term, with the boss opting for a 4-1-4-1 system that has only one defensive midfielder. Bayern Munchen played with two defensive midfielders last season and the player whom Guardiola has charged with the responsibility of holding together everything, Bastian Schweinsteiger, has found himself out of position at vital times this term already. Furthermore, Schweinsteiger is in a degree of doubt for the UEFA Super Cup having hobbled off late versus Freiburg. With both Bayern Munchen and Chelsea motivated to win the UEFA Super Cup – Bayern to avenge its UEFA Champions League loss and the Blues to make up for last season’s 1-4 defeat against Atletico Madrid in the corresponding match – bet on an exciting game in which both teams rustle the onion bag.